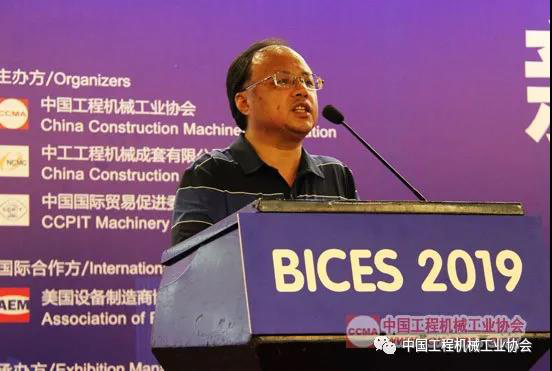 On the morning of June 20, 2018, the 15th China Beijing International Construction Machinery,Building Material Machines and Mining Machines Exhibition & Seminar (BICES 2019) press conference was held the in Beijing with the expo theme of “Intelligence Connects the World, Green Draws a Better Future”. More than 70 mainstream and industrial medias like People’s Daily, Xinhua News, Economic Daily etc as well as exhibitor representatives from LIUGONG, CRCC, SINOMACH, SHANTUI, JLG, TEREX, HITACHI, KAWASAKI, KOHLER, ISUZU etc and representatives of users, universities, and partners over 130 people came together to witness the official launch of the BICES2019 industrial event. Mr. Qi Jun, Chairman of the China Construction Machinery Association (hereinafter referred to as the Association) , Mr. Su Zimeng, Vice Chairman & Secretary-General of the Association, Mr. Han Xuesong, Honorary President & Chief Consultant of the Association, Mr. Zhou Weidong, Vice Chairman of Machinery Sub-Council of the China Council for the Promotion of International Trade, Mr. Lv Ying, Deputy Secretary-General of the Association & General Manager of Beijing Asiamachine International Convention Exhibition Ltd., Mr. Wang Jinxing and Ms. Yin Xiaoli, Deputy Secretary-General of the Association etc attended the event. The conference was hosted by Mr. Zhou Weidong. 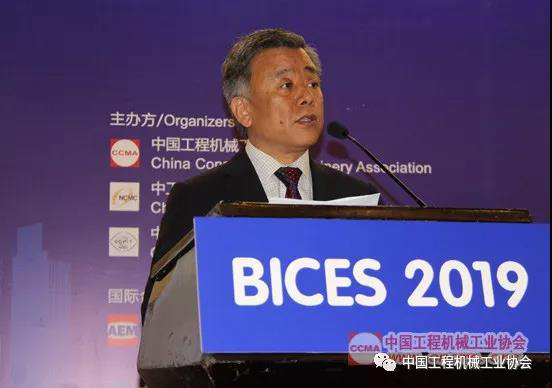 At the press conference, the organizers announced that BICES2019 will be held from September 4th to 7th, 2019 at the China New International Exhibition Center (Beijing). In addition, the 5th China-Beijing International Commercial Vehicle Expo, China International Emergency Rescue Equipment Exhibition, BICES China International Construction Machinery Innovation Products and Recommended Products Competition, the 5th "CRCC Cup" BICES China International Construction Machinery and Special Vehicle Creative Design Competition will be held in the same period and same venue. Mr. Qi Jun, Chairman of the Association made a analysis about the construction machinery industry operations in 2017 and forecast of development trend in 2018. He said that after five years of full adjustment in China's construction machinery industry, sales revenue in 2017 was 540.3 billion yuan, up 12.7% year-on-year, and total exports value were 20.015 billion US dollars, up 18.5% year-on-year.The key products of the Association’s focus on sales increased by 45.6% in 2017. From January to May in 2018, sales increased by 35.6% year-on-year, and exports increased by 40% year-on-year, exceeding expectations. At the same time, it released relevant data on the holding quantity of construction machinery equipment by the end of 2017, and forecasted the trend of the industry's operation in 2018. 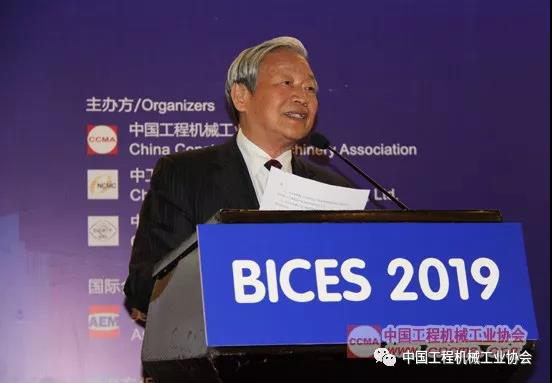 Mr. Qi expects the industry will keep a steady and good development trend in 2019, and BICES exhibition will also continue to flourish, hope that BICES to be supported by everyone continuely, and welcome more companies and users to participate in BICES show. 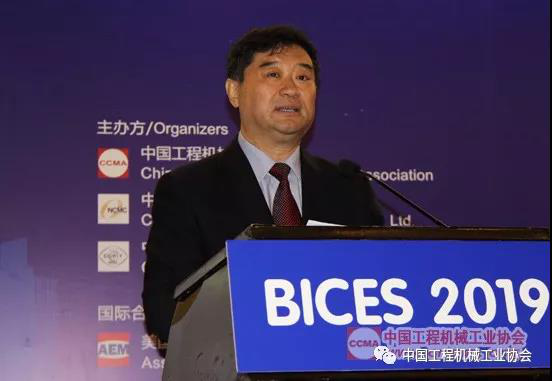 Mr. Su Zimeng, Vice Chairman & Secretary-General of the Association gave a speech on the theme of“Handing Out BICES2019 and Giving Gifts to the 70th Birthday of the Motherland”. He introduced: BICES, founded in 1989 in Beijing, during the 30 years of development, BICES show, with its unique territory advantage of based in Capital Beijing, facing the whole country, with a view to the world, and make continuous innovation, provide enthusiastic service, and now develops to be the well-known international show of construction, building material and mining machinery in both scale and quality. First, Plan and organize a series of celebration activities to celebrate the 70th anniversary of the People's Republic of China. The BICES Organizing Committee will strongly support the celebration of the 70th National Day that will be held by the exhibitors and relevant media and organizations, meanwhile, we ,organizers will set up special exhibition areas for showcase and illustrate the achievements of China construction machinery made in the past 70 years to celebrate the 70th anniversary of the People's Republic of China. The special exhibition can be made in pictures, exhibition boards, and films and televisions. Moreover, we will held related forums and rewards, and invited outstanding entrepreneurs and specialists in the industry to talk about their true feelings. 1 Outdoor Area: It will focus on a group of large-scale key enterprises through smart, green, complete sets, heavy equipment and other high-level, serialized product display, equipment operation demonstrations and events organizing showing the exhibitors’overall strength providing various types of equipment for the national economic development and construction of the One Belt One Road. 2. The theme hall of high-end equipment: It will focus on displaying high-end equipment, shield machines, and boring machines featuring high technology and high quality to demonstrate the ability and level of exhibitors to provide major technical equipment for various users. 3. Green Development Theme Hall: Showcasing new technologies such as four-stage engines, low-emissions equipment, post-discharge technology and equipment, and green construction and remanufacturing technologies. 5. Smart Hall: It will display the smart technologies and equipment that is developed by exhibitors taking using of smart ideas, smart processes, smart manufacturing, smart technologies, smart products, and intelligent management. 6. Emergency rescue equipment show area: It will display the new achievements and social responsibilities that related companies have achieved for the development of ice and snow and emergency rescue equipment industry. 7. AWP equipment show area: It will display the rapid development of AWP equipment section in China and the achievement made by the well-known brand enterprises of both home and abroad and their established market position. 8. Road Building and Maintenance Equipment Show Area: This is a dedicated exhibition area for users in low-emission regions such as Beijing and Xiong'an New District, so that to allow users of road equipment in Beijing and Xiong'an New District to select and buy equipment that meets the new emission requirements and to upgrade the existing equipment. 9. Parking equipment show area: It will showcase the rapid growth of this emerging field of parking equipment and the technological advantages that construction equipment manufacturers held in develop and building parking equipment. 10. Modern Logistics Equipment Zone: As an important part of the industrial chain of construction machinery, it will focus on demonstrating new achievements made by industry leaders in modern logistics equipment such as forklifts and commercial vehicles. 11. Local characteristic equipment exhibition area: It will fully demonstrate the new developments in the transformation and upgrading of the industrial chain and the improvement of quality and efficiency in the industry equipment with related local characteristics. 12. Construction Machinery Culture Experience Area: The BICES China International Construction Machinery and Special Vehicle Design Contest will be displayed in a concentrated manner in this area, and a simulated driving operation can also be experienced at this area. We believe that these themed halls and feature show area will each have their own characteristics and brilliant features, which will be conducive to the openness, integration, and innovation among all sectors of the industry and among related groups and users. Third, Strive to invite more than 150,000 buyers and visitors.In view of Beijing’s unique geographical advantages, most of the large corporate headquarters of large construction companies in China, Fortune 500 companies and other large companies are located in Beijing. So, in terms of invitations for domestic buyers and visitors, we will focus on Beijing, Beijing-Tianjin-Hebei and Xiong'an New Districts, and of course face to all regions of China, invite major construction contractors, construction companies, leasing companies, and engineering companies, as well as professionals in large-scale enterprises and users of the railway, petroleum, petrochemical, municipal, power, coal, and transportation etc., to visit BICES 2019. At the same time, we will plan and carry out "Thousands of Users Conference" and "10,000 Buyers Visiting" program, and strive to invite the most important user representatives from the construction machinery industry to visit BICES 2019. In terms of international buyers and visitors invitation, we will invites international key buyers to BICES 2019 directly, meanwhile, we will continues to improve the presentation and promotion of BICES 2019 at those international construction equipment exhibitions in South Africa, France, Russia, Turkey, South Korea, India, Indonesia, Germany, and etc. At the same time, we will strengthen cooperation with industry organizations, agencies in China, and overseas news media in relevant countries, and get BICES 2019 promoted by magazines, websites, microblogs, short messages, written news (Facebook), emailing, and direct mailing, covering countries and regions of Europe, the Americas, Russia, the Middle East, Southeast Asia, and Africa. Free tickets are still available with registration on line for visitors, while ticket fees will be charged for those visitors registered on site. With the above measures and efforts, the Organizing Committee strives to invite more than 150,000 buyers and professional visitors to BICES 2019, which will exceed visitor’s number of 120,000 at BICES 2017. 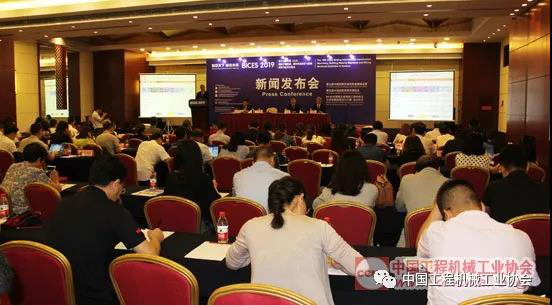 Fourth, Various of industry meetings, conferences and events will be organized during BICES 2019. The majority of exhibitors and visitors agreed that the featured activities of the BICES exhibition have obvious advantages. In the last exhibition, there were more than 100 special events, among which many events organized by the association were bright and welcomed. 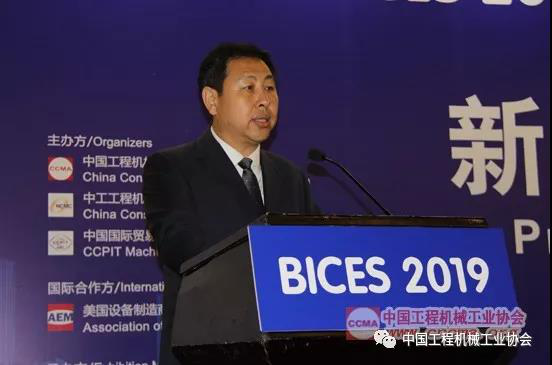 Fifth, Improve planning, running and management of BICES 2019 show with high quality and satisfactory results. Our organizing committee and all staff must work with scientific and rigorous work attitudes, strive to ensure that exhibition propaganda, exhibitor services, visitor’s invitation, on-site management, transportation, accommodation, tourism visits, and event arrangements are fully implemented. At the end of this press conference, we hereby announced the start of exhibitor registration application process, and the registration forms, participation contracts, and exhibition brochures will be officially released to all exhibitors, and everyone could log on both organizers and the co-organizer’s website to download registration form and BICES material. It is important to note that, in order to facilitate the arrangement of booths, reduce the cost of participation, the BICES2019 Organizing Committee released hereby the following preferential policies: that is, those exhibitors who fill out the exhibitors Registration forms and make a prepayment of 10% of the deposits before December 25, 2018 can enjoy a 5% discount on the total booth fee (see the participation contract for details). Mr. Lv Ying, Deputy Secretary-General of the Association & General Manager of Beijing Asiamachine International Convention & Exhibition Ltd. read the announcement on“continue to select the BICES China International Construction Machinery Innovation Product Award and Recommended Product Award”. BICES China International Construction Machinery Innovation Product Award and Recommended Product Awards are selected to increase the competitiveness of China's construction machinery products in the international market and boost the innovative development of China's construction machinery products. Passed by the second session of the fifth member congress of the Association and decided to appropriate awards to the construction machinery and parts and components exhibiting in BICES with excellence innovation and market applications from The 14th China Beijing International Construction Machinery,Building Material Machines and Mining Machines Exhibition & Seminar (BICES 2017). Last year, the first competition received positive feedback and enthusiastic registration from the exhibitors. According to the registration status, the organizing committee organised authoritative experts to conduct a serious and independent evaluation for each of the participating product at BICES 2017. The Innovative Products Award focuses on innovative, practicality, advancedness, appearance quality, independent intellectual property rights etc.The Recommend Products Awards focuses on advancement, reliability, durability, appearance quality, cost performance and market influence. In the first competition held last year, 76 outstanding products from 41 exhibitors won the BICES 2017 China International Construction Machinery Innovation and Recommended Product Awards, which aroused enthusiastic responses inside and outside the industry. 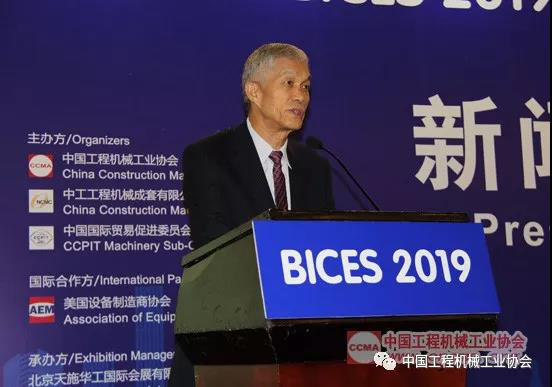 BICES 2019 will continue to organize industry leading experts on the basis of declarations by exhibitors and recommend the outstanding products, technologies and service solutions of the Chinese construction machinery industry to the whole society. Mr. Han Xuesong, Honorary Chairman and Chief Consultant of the Association, introduced the development of previous competitions on behalf of the Design Competition Organizing Committee, unveiled the competition with other participating leaders, and announced the 5th "CRCC Cup" BICES China International Construction Machinery and Special Vehicle Creative Design Competition was officially launched. Mr. Ma Chengbiao, Director of Promotion Brand Division of China Railway Construction Heavy Industry Co., Ltd （“CRCC”）made a speech on behalf of Creative Design Competition title sponsor, and unveiled the competition together with other participating leaders.